Unusually adept at description, the authors manage to paint everything—not just characters, but also their backdrops—in terms both literal and metaphoric: “He had the profile of a wading bird, as though he were an ancient hieratic sculpture carved in dry boxwood and lost among the shop’s odds and ends.” And where one might expect the scenery to be focused on the lushness of the countryside, the reader is instead introduced to the changes the region has undergone: “The modernist garden housing development was a chaotic landscape, with blocks of eroded buildings emerging from sickly vegetation.” And it turns out that changes like this are decidedly germane to the story. The mystery begins after estate owner Denis Massepain issues an urgent request to his long-time friend Benjamin Cooker. 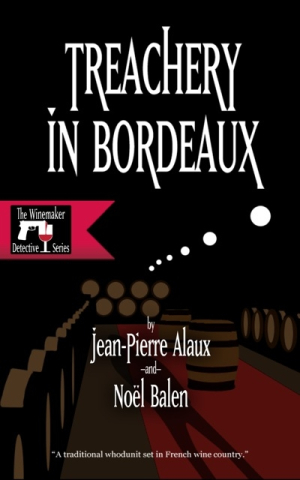 When Cooker arrives at the Château Les Moniales Haut-Brion, he is informed by an exasperated Massepain that several barrels of the Haut-Brion have been tainted. He suspects sabotage. Any reader who is a true student of wines or winemaking will thrill at the details the authors share as they investigate the estate-threatening situation. And those who are not may at least delight in being given a glimpse into some of the day-to-day workings within this very specialized world, with its painstaking methods and highly guarded secrets. Dialogue is smooth, and narrative is never wasted: “He caught the reference as it flew by.” Peppered with an occasional nod to philosophy, there’s genuine food for thought if the reader takes the time: “Everything and its opposite are the usual lot of exceptional people, the ransom paid by those who have succeeded in imposing their singularity.” There is no awkwardness in the book’s translation from French; in fact, a reader would never guess it had ever undergone the process. There are a few minor typos, but they in no way detract from the story’s readability. The book’s plot develops quickly, and the crime is solved effectively, but not until it takes an interesting twist into the seemingly unrelated realm of art. Above all, though, it is in meeting the characters that the reader might find the most pleasure. While it’s a mystery, it is not the solution that is paramount here, and the journey through its pages is not to be rushed.